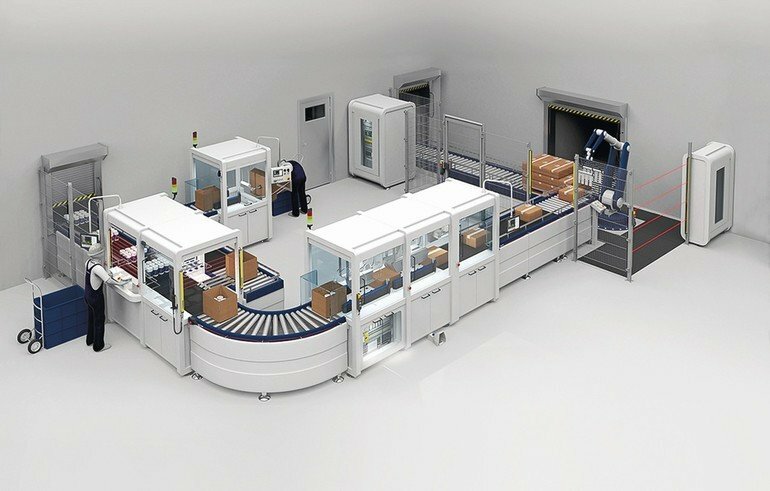 If the signals from the safety switchgear, e. g. in packaging lines, are comprehensively evaluated, there are real benefits, including maintenance. The connection via an OPC UA server provides the prerequisite. Many experts believe that OPC UA will establish itself as the new communication standard for digital production – and chemistry and process engineering are no exception. The latest generation of safety controllers from Schmersal is therefore shipped with an OPC UA server, paving the way for a seamless data flow from (safety) sensors to the top levels of corporate IT. From the sensor in the machine to the top management levels of the central IT systems such as ERP, PPS and MES, seamless data exchange is one of the most important features of digital production structured in accordance with Industry 4.0 principles. 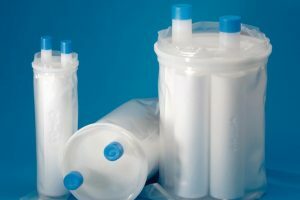 This also applies to safety switchgear and hence the safety of machines and equipment in chemical and process engineering, including the downstream processes of filling and packaging. Two data worlds, which fulfil different requirements and have different design bases, always need to be taken into consideration. At the functional safety level are the requirements of the Machinery Directive and the standards and regulations assigned to it. Amongst other things, they deal with the ability to switch machines off safely and stop hazardous movements when the operator opens a guard door or enters an area secured by opto-electronic safety devices. generates operational data, i. e. non-safety related. This is of interest to users, for example, because it allows maintenance to be optimised and system productivity improved. The number of switching cycles provides an indication of when safety sensors and actuators are reaching the end of their service life and need replacing. For electro-mechanical switchgear which is prone to wear, this number can be derived from the MTTFd (mean time to dangerous failure), which according to EN 13849-1 must be calculated based on the B10d value (nominal service life to dangerous failure). This, in turn, is based on T10d, which defines the time for preventative replacement, namely 10 % of the MTTFd. Here, too, the service life can be determined very accurately if the switching cycles are counted at the same time. 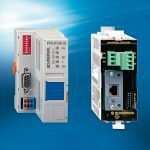 In practice, the safety switchgear can then normally be used for longer and does not need to be replaced on a preemptive basis at the end of a calculated service life. These and similar functions are currently the subject of fierce debates under the banner of predictive maintenance. In many companies in the chemical and process industries, they are the first real-life applications for digitalisation and Industry 4.0. For some time now, there have been various ways of networking the information generated by safety sensors. In terms of functional safety, there are safety instrumented bus systems such as AS-Interface Safety at Work (ASi SaW). To enable operational signals such as threshold range warnings to be transmitted and evaluated, Schmersal developed the SD bus which, if required, can also send this data to any cloud via the SD gateway. 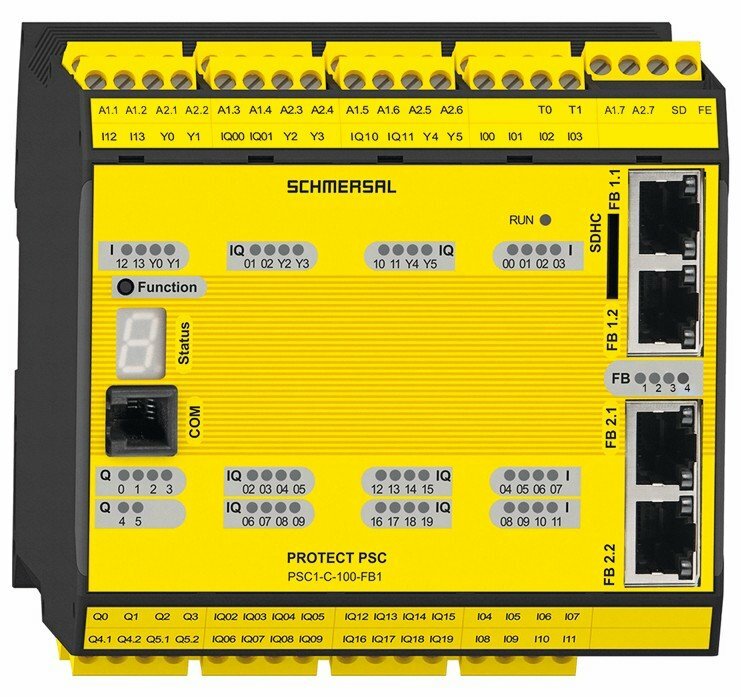 Schmersal offers users of the Protect PSC1 more extensive options for networking and integration. 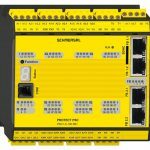 This safety instrumented controller can be fitted with a universal communication interface for connection to numerous fieldbus protocols such as Profibus, Profinet, Ethercat, Ethernet/IP, CANopen, etc. 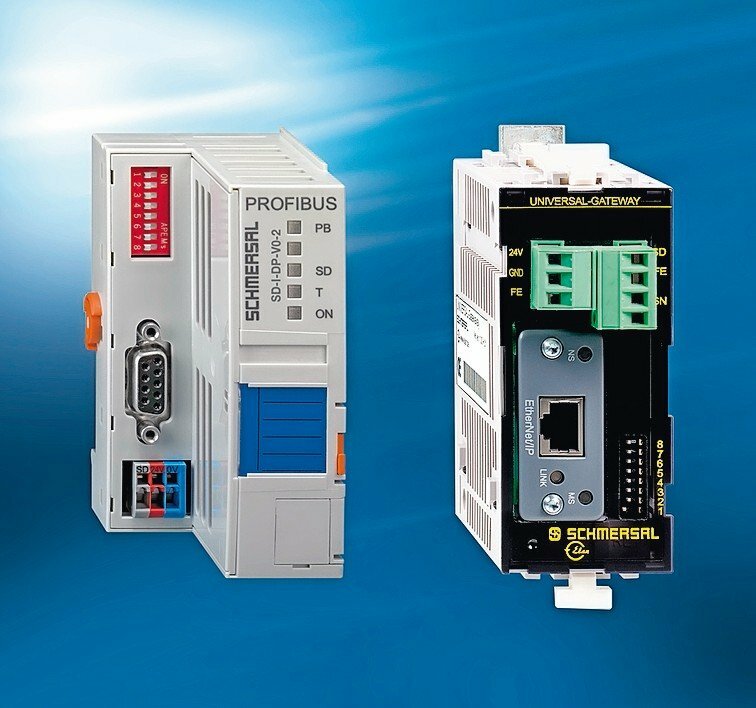 The user can simply select the relevant fieldbus via the software, meaning that all fieldbus versions can be covered with two different hardware components. The latest version of the Protect PSC1 comes with a built-in OPC UA server in the communication interface. Apart from HMI access as well as commissioning and support services, this interface also allows digital asset management (DAM) services. This mode of communication via the OPC UA server offers added options and benefits. 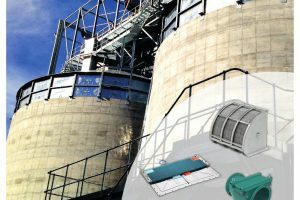 Comprehensive data records from all safety sensors in the Schmersal range can now be accessed in machine-readable format, with semantic descriptions via the M2M communications protocol, for example status data of safety outputs, safety parameters, sensor lifecycle information, order details, datasheets or CAD data and pictures. As one specific example, users can specify the target service life, i. e. the maximum number of switching cycles per item of safety switchgear, with the SafePLC2 programming software. The controller records the actual number of switching cycles and notifies the user when this number is reached. The device in question can then be replaced at exactly the desired time. Safety sensors with a connection to the above-mentioned SD bus can also transmit information, e. g. about the actuator, as well as error messages such as cross-wire short, overtemperature, internal device error, communication error, output Y1/Y2, etc. The integration of OPC UA into the Protect PSC1 communication interface is likewise an important condition if actual data from Schmersal safety switching systems (and therefore their digital twins) is to be exchangeable regardless of the manufacturer, for instance from one machine to another or for communication between factories. The use of the global OPC UA standard (IEC 62541) ensures interoperability between products from different manufacturers and offers real added value for users of machines and equipment. They have access to additional information, for example in order to lay the foundation for improved production control or more efficient maintenance planning. Moreover, product parameters can be consulted and their documentation or operating instructions uploaded. Provided this data is used intelligently and evaluated by higher-level CRM, MES or ERP systems, it can also open the door to new business models. 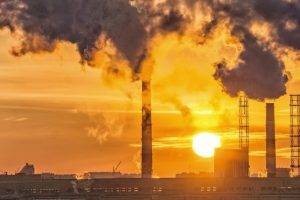 This applies not only to the users of machines and equipment but also to the manufacturers, who can then supply new services based on this data. For these reasons, OPC UA is the first choice for Schmersal when it comes to making its product portfolio Industry 4.0 compliant. As yet, OPC UA is not that widespread in process engineering equipment and controllers. However, this integrated interface gives Protect PSC1 users peace of mind when planning and developing next-generation machines. It is not hard to imagine that networks of machines will rapidly become established in the same way as the generation and transmission of data from machines and systems or the use of such data for predictive maintenance. These are just some of the reasons why large production companies are jostling to introduce OPC UA as a binding, non-proprietary standard. The discussion on Industry 4.0 is providing additional impetus. For example, fifteen working groups at the German Mechanical Engineering Industry Association (VDMA) are currently working on application-specific OPC Companion Specifications, i. e. standardised data and interfaces for individual applications such as robotics or industrial image processing. The OPC Foundation also recently set up its own working group on Functional Safety. 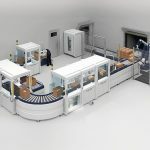 Thus, all the signs are that OPC UA will soon become established as the communication standard for digital production – and the process industry, with its interlinked production and packaging lines, is no exception. There are major benefits here for comprehensive M2M communication.